The WordPress SEO section discusses applied SEO strategies. As you know, Thesis provides numerous SEO settings and options in the administration interface. Familiarity with these Thesis SEO interface options will help you make the most of the WordPress SEO articles’ concepts and advice. SEO is a large topic — where it begins and ends is a gray area. Shake the magical dust from SEO, however, and you’re left with a very simple “my site” goal — optimizing your content for search engines. Fundamentally, optimization means clarifying what your site, and individual pages of content within your site, are all about. That’s it! In the real world, imagine a book without a title. Probably not. Unless you find more information about the unknown content, you’ll leave it on the shelf. Whether you imagine books in a library or a list of search results (sites) to choose among, information is everything. With millions of options out there, selecting your reading at random is an inefficient way to make decisions on how to spend your time. That’s why we often do judge books (and sites) by their covers. A book with a confusing title — or no title at all — reduces “first glance” comprehension by an onlooker. Your site is no different. Books — where this is especially true for nonfiction — need a clear and descriptive title that gives a potential reader at least some understanding of what they can expect to find inside. All the parts and pages of your web site? Exactly the same deal. Along with a title, your site also needs descriptive text and other “what’s this all about?” information to give your potential visitors the ability to confirm your content matches what they search to find. Online, finding typically means using a search engine like Google or Bing. Basic SEO, therefore, is about offering “first glance” information about your site. 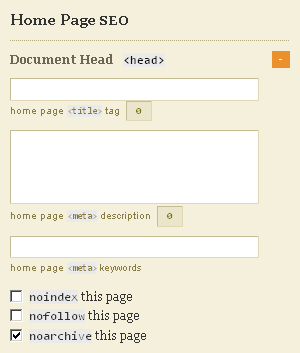 To add this, let’s examine the relevant areas of SEO within the Thesis 1.8.2 interface. The focus here is on the how and where of the Thesis interface SEO options. With a grasp on how and where, you’ll be able to maximize your search engine rankings, as well as more easily digest the WordPress SEO series. The following are the main SEO-related content areas in Thesis: global or site-wide SEO, home page SEO, category-specific SEO, and individual SEO settings on posts and pages. All this SEO stuff, at a basic, on-site level, is easier than it sounds — we’ll take each section in turn, step-by-step. In this one tutorial, you’ll quickly see that SEO basics are extremely powerful — and they’re not scary whatsoever. A global setting simply means that the options selected apply “everywhere” on your site — home, pages, posts, categories, tags — everywhere. There’s only one global SEO setting of major significance, and that’s whether or not to have “Append site name to page titles” selected. Except in very rare cases, it’s usually low, no, or a negative to your site SEO to append the site name to your page titles. If your site title is only a word or two, it can make sense. But even then — usually not. The reason you don’t need to append your site title to every page is that your site flows with Yoda calls it the Force PageRank. In other words, search engines move through your site in a way that creates a series of relationships. From these relationships, an understanding of the site’s context and influences is created. A page, therefore, is not an isolated blip on the radar. Each page — using “page” in the sense of any URL — inherits traits from other pages. The verbiage and links, to and from other pages — including the (relatively) powerful home page — are influential. As a result, even if your site name appears only on the home page, that’s usually sufficient. Once Google knows your site name, everything else is seasoned within the context of the site name and other global factors — not all of which are on your site, or even within your full control. Adding the site name globally therefore often does little more than dilute the SEO value of non-home <title> markup. Any gains from site-wide appending (repetition) seldom offset this dilution. With a strong brand, especially a short one — Sony, Asus, IBM, Apple — appending the site name to your <title> globally can be a rational decision. However, if you’re just getting started — especially if your “brand” is relatively unknown — it’s recommended you do not append the site name globally. Note that this Home Page SEO control applies only if you are using the default “blog home” — if you are using a static home page, the SEO controls for your “Home” page will be located in the settings for the individual page used as the static front page. We’ll cover page-specific SEO later. Home Page SEO — the <title> — this one’s a big deal. The <title> carries a ton of SEO power, and on your home page it carries more than it will anywhere else. As you can see in the image above, there’s a character counter in Thesis to help you limit this field to the number of characters traditionally shown by Google in a “SERP” or “search engine results page” — but you don’t have to “fill it up” — in this setting, less is often more. While true of other SEO-related content, in the <title> especially, every word should be chosen with care. Welcome to SuperTreeExpertPeople.com — If You Have Trees, Plants, Bushes, Shrubs, or Grass You Need Worked On, We Can Do Anything! Call us Now if You Need Tree-Related Services in Fargo, North Dakota! Clearly, that’s too long. It’s also using numerous terms that are unlikely to help your site, even if you did rank for them — “Welcome” being an example. Search Engines are good at inferring specific place names, so “North Dakota” is unnecessary, especially if you include your address (as text) on a contact page or in your footer or header. For your Home Page <title>, focus on what you already do — and do well. If you’re new to the market, focus on what you expect or want to do more often. For example, if you get most of your net profits from tree-related “stuff” — but very little from shrubs — then stick to what works. While this is better than the previous example, it’s important to realize SEO is not about instant perfection, and SEO done well is not just “set and forget” — installing monitoring code such as Google Analytics can help you determine what’s working, what’s not — and this will help you make informed changes to your SEO tactics over time. 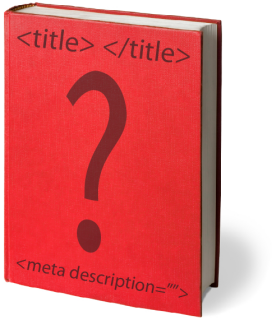 Home Page SEO — the meta description — the “SEO” factor that does not have a direct SEO impact. That’s right. Your meta description does not influence the “rank” or position of your site in search engines. It’s not SEO! Okay — so if the meta description isn’t a technical SEO factor, why worry about it? The answer is that your meta description is an influence, and to ignore it is to miss the point of SEO in a larger context. You’re optimizing and defining your content, right? You’ve seen search results many times, and while the eye is drawn to the “title” first, the description is the convincing blurb right below the title. That makes your meta description “SEO that isn’t SEO” — because while the description is not an SEO ranking factor, a good description is still a “call to action” — and it will often be the difference between visitors clicking your site… or clicking on a competitor’s link! Also, any terms used in a query to find your site that match the meta description’s content will be bold in search results, another reason a good description is useful as an “SEO” factor. It’s obvious that your meta description should be created with care. Unlike the brief <title> recommended earlier, it’s best to make your meta description close to the maximum length that will be displayed by Google. Short meta descriptions are often replaced by “rich snippets” — pieces of your content stitched together by a search engine like Google, using text from the page rather than the meta description you added manually. Because the meta description is a good conversion tool, representing a call to action (click!) — write a good one, and make it long enough that your meta description is more likely to be chosen as the content Google displays to potential visitors. As a rule of thumb, add about 150 characters of quality “I’d click that!” content to your meta description. Remember, this is your home page, so target your prospects broadly. Be sure to provide solid reasons to click on your site! You could include a list of your services, your solutions to common client problems, FAQ or trust-building information such as being “insured” or “licensed” or a member of the “BBB” — anything to generate (legitimate, of course) trust and authority in your area of specialization. Home Page SEO — the meta keywords — like the meta description, meta keywords are of no SEO benefit. Unlike the meta description, meta keywords do not offer any other benefit for the vast majority of sites — and they aren’t visible in the search results listings. About the only thing to say about meta keywords is to avoid “stuffing” more than a few key terms or words into this field. The tactic of “keyword stuffing” — adding dozens or even hundreds of key terms — was the primary reason why meta keywords became worth little (if anything) many years ago. As you might guess, leaving the meta keywords blank is fine. Home Page SEO — nofollow, noindex, noarchive — because these checkboxes are included in the interface, a quick word on them. Do not click nofollow or noindex in your Home Page SEO options. Simplifying for clarity, using nofollow/noindex on your Home Page tells search engines — like Google — not to include your site in search results. Ever. Ouch! Unlike nofollow and noindex, noarchive is less of an SEO-related decision. Noarchive is a choice to tell various web sites, including search engines, whether or not they should maintain a history — a saved cache — of your site’s home page. From an SEO standpoint, noarchive is unlikely to have an impact on your site. But unless you have a full understanding of what it does, there’s no harm in leaving it unchecked. In summary, leave the checkboxes for nofollow, noindex, and noarchive alone — meaning, not checked — on your Home Page SEO settings. If you use categories for your posts and include categories in your site architecture as an SEO device — most Thesis users do — then you’ll benefit from applying the same principles of SEO discussed in the Home Page section on your categories. In short, populate your categories’ <title> and meta description, with the contents adjusted to fit each of your categories. There are two ways to add your SEO details to categories — you can either create a new category, or you can edit an existing category. The layouts are slightly different, but they’re close enough it’s assumed explaining one explains both as regards the SEO sections. The SEO fields above are blank when creating a new category. They’re shown with populated data to serve as a quick summary of what a completed — individual — category’s SEO content might look like when finished. Above you’ll again notice the <title> and like the Home Page SEO, this field should be under 70 characters — shorter is fine — and very succinct. Remove filler words, but remember that real visitors will see this content — make sure it reads fluently and conveys the basic idea of the category’s contents. The meta description also returns, and again it’s not an SEO factor — but it remains a “convincer” — the time spent on a quality meta description is worth extra effort if your categories are common landing points for visitors. 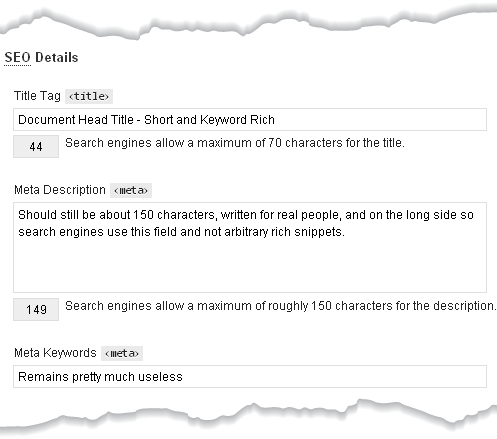 Finally, adding or editing a category’s meta keywords can be skipped — or at most, keep the meta keywords to a minimum. Again as seen in the Home Page SEO setting, if you’re using categories as part of your optimization strategy, they need to be followed and indexed. Archived or not is up to you — it’s not an SEO factor. 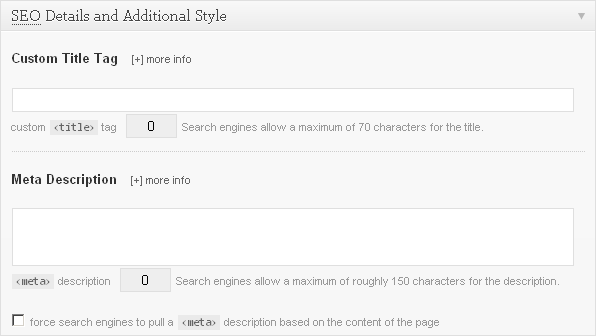 Compared to the Home Page SEO settings, your categories get two additional SEO-relevant sections. These fields are similar to the visible H1 “title” and content of individual posts and pages. 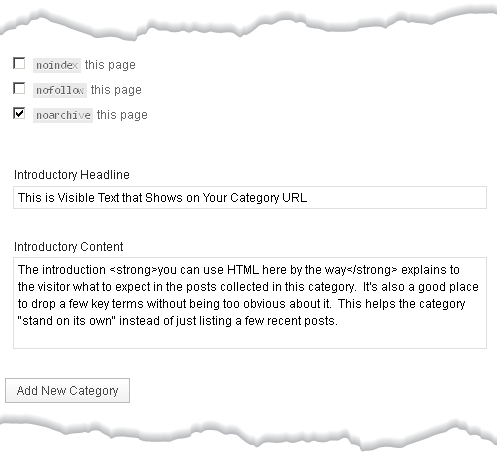 The Introductory Headline field contents will appear as text on your category landing page — it will be wrapped in H1 tags. The Header One or <h1> tag is a second-tier SEO device — important, but not as important as the <title> you created in Part I. As a rule of thumb, make your Introductory Headline relevant to the category’s posts. If you’re working with a category about evergreen trees, you’d probably include the word “evergreen” in the Introductory Headline. The Introductory Content has no more SEO value than any other “paragraph” of content. However, because category pages are otherwise “a list of posts” the content here is potentially more “important” than pages or posts — because post and pages often have many paragraphs of unique content. What you write for Introductory Content is not only useful to your visitors, it can help individual categories stand on their own legs from an SEO perspective — thus making your categories more than just a temporary dumping zone for assigned posts. How much Introductory Content you add is up to you — describing the category’s posts should offer natural opportunities for using key terms throughout this section. 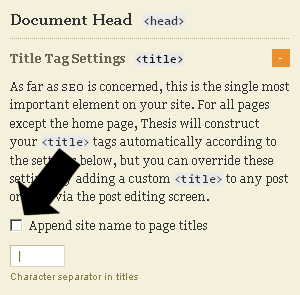 First off, it’s worth noting that Thesis will “create” a <title> and meta description for your posts and pages automatically, in the event you do not create manual SEO data for individual posts and pages. For sites with high volumes of low-quality content, that’s probably good enough. But for unique, high-quality content, leaving your <title> and meta description to automation is the SEO equivalent of using a rubber stamp to sign birthday cards. If you cared enough to write that page or post, spend a minute or two on the SEO. Again, the meta description won’t climb the ranks for you, but an automatic excerpt for a meta description is not as convincing — convincing to visitors you want to click-through from a search results page — as a hand-crafted description. If you’re still not convinced, again, with Thesis you don’t have to write SEO details for every last page and post. But you should. Remember, way back, when SEO was declared not-scary? If you’ve already read the Global, Home, and Category portions of this tutorial, how bored scared are you right now? 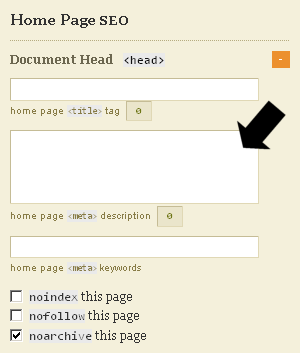 For SEO purposes, add a <title>, then add a meta description. The meta keywords remain of low or no value. Do not check noindex or nofollow for an individual page/post unless you have a good reason to do so — an isolated or very temporary landing page could be an example. How easy was that? You’re practically an SEO rock star! Notable at this point is that our Thesis SEO walk-through has gone from top to bottom. At a very high level were the Global and Home Page SEO settings. A step down — because presumably you have more than one — were the categories, where SEO details for categories should be more specific than the Global or Home sections. Finally, you’re down to a single unit of content, a page or post. Here, it’s all in the details. Really specific ones! That’s an SEO shotgun. However, one of your categories would drill-down into a more specific area, such as “Trimming” — and a sub-category to “Trimming” like “Hedge Trimming” would become more detailed yet. The <title> and meta description would “zoom in” more for a category than the Home Page SEO choices. And now, with a post in the “Hedge Trimming” category, you’ll dig even deeper into SEO detail. With careful top-down SEO — where the Home Page feeds into a Category that feeds into a single Post — you’re all set. Heads-up, Fargo Tree People! There’s a new player in the SERPs — one with a solid grasp on basic WordPress SEO.